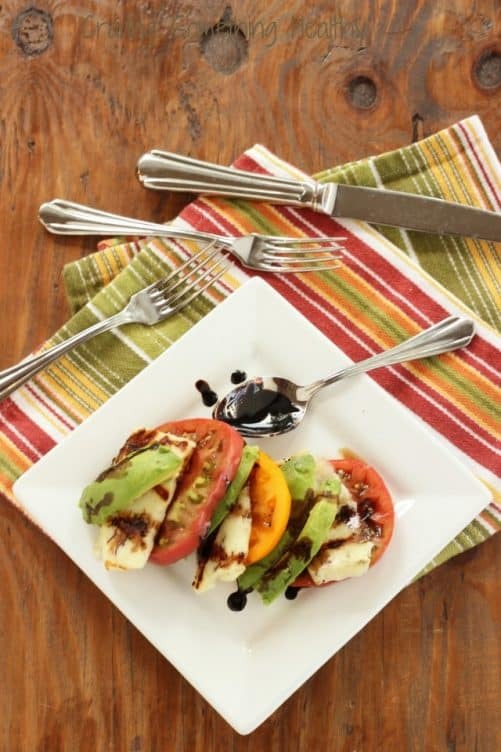 Is it OK to call this a Caprese salad? I’m pretty sure (or at least Wikipedia says) a true Caprese salad, or Insalata Caprese, as they call it on the island of Capri, features slices of ripe of tomatoes, layered with fresh mozzarella and basil. Mine does not, but that’s no reason to get nitpicky about the name. 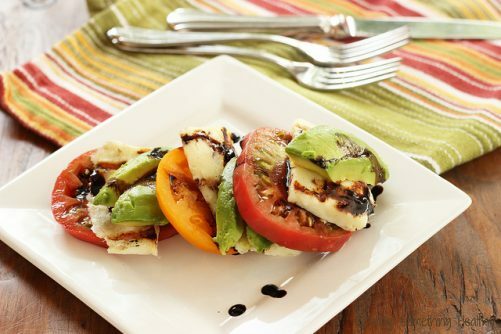 I’m still celebrating those gorgeous end of summer ripe tomatoes – heirloom in this case, but instead of mozzarella, I’m using sliced grilled Haloumi cheese. And instead of fresh basil, I’m going with slices of avocado. Drizzle a bit of balsamic reduction over the whole thing, and WHAT’S NOT TO LOVE? This is my perfect ultra-fast, late summer, dinner for one. Or maybe two, but this night it was just me and my tomatoes. Poured a nice glass of wine, opened up the Pottery Barn catalog – or was it J Crew, or Boden… and enjoyed my peace and quiet while I imagined my house all decked out with new fanciness. Or make that me in a new fall wardrobe. Please buy the freshest, ripest (most ripe?) tomatoes you can find for this dish. They will make you happy. One large or two small ones will probably do. And if you’ve never had Halloumi… RUN and get it. I can’t get enough of its squeaky texture and salty, smoky flavor. It really will hold up on the grill. No real recipe here folks. Just layer the tomatoes with the cheese and the avocado. Oh yeah, you do have to simmer about 1/2 cup of good balsamic vinegar until it looks like chocolate syrup and reduces to just a few tablespoons. So good. Are you tomato-ed out yet? If not, try my Summer Roasted Tomato Tart! Get ’em while you can, because it’s just about pumpkin season! This salad looks delicious, Anne! 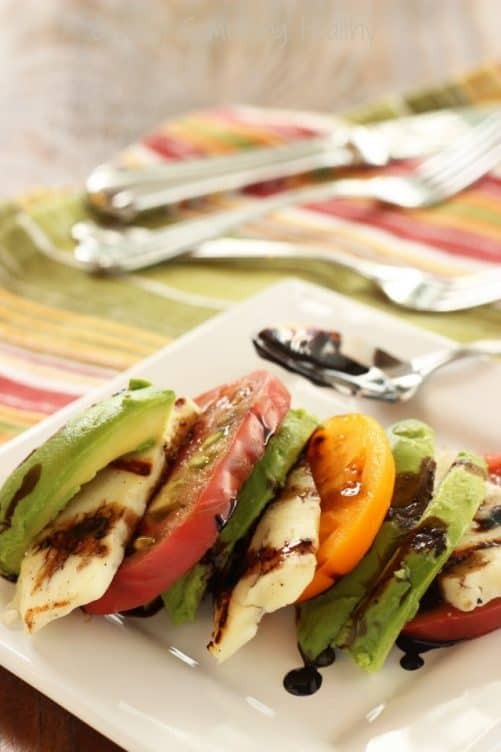 I’ve never paired sliced tomatoes with grilled halloumi before! It was great meeting you at Blog Brulee! Thanks so much Lisa! I love helium with anything 🙂 It was such a pleasure to meet you too – wish we had more time to chat! I’m a huge Halloumi fan; love the sound of this!